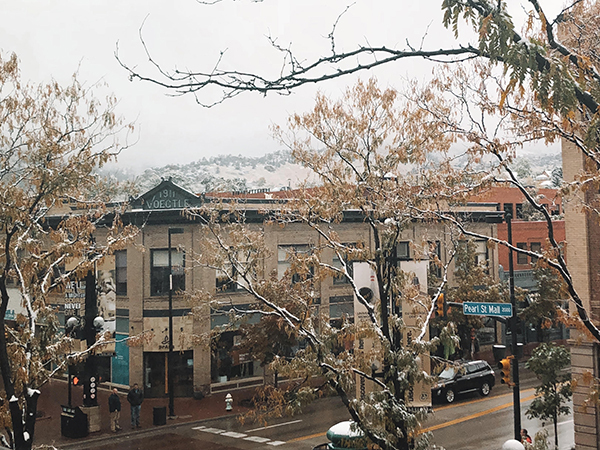 Wintertime on the Pearl Street Mall is one of the most beautiful times of the year. The bricks dusted in snow and the sleepy atmosphere of the mall make for a scene that looks like it belongs on a postcard. While many believe the prime time to enjoy downtown Boulder is during the warmer seasons, winter offers many fun, cozy, indoor activities that everyone can enjoy. One of my favorite wintertime activities is strolling on the Pearl Street Mall. Get bundled up and grab friends or family and enjoy the beautiful sights of various holiday decorations, snow, and to warm up pop into any of the shops along the mall. I like to cozy up with a good read at the Boulder Book Store, Boulder’s independent bookstore since 1973, here you will find thousands of new and used books. I love to sit on the second floor of the bookstore in the fiction section and riffle through some books I’m interested in and watch the snow fall outside. Another great way to spend a snowy day in Boulder is heading over to the Dushanbe Teahouse to warm up with some delicious tea. The colorful interior is the perfect place to spend a gray day. Pop into the Boulder Museum of Contemporary Art right next to the Teahouse to enjoy vibrant contemporary art, changing exhibits and diverse aesthetics portrayed in this beautiful gallery. If you’re looking for a place to escape the cold and eat some delicious comfort food while walking around Pearl Street I recommend trying Zoe Ma Ma which serves authentic Chinese street food. Warm up with a piping hot bowl of noodles, or try any of their delectable steamy buns or potstickers! Zoe Ma Ma is sure to keep you warm on those chilly winter days. Another great winter activity is attending a concert at the Boulder Theater. The historic theater is located right off the mall on 13th Street, and offers a variety of live music performances as well as film showings. I also recommend heading over to the Laughing Goat Coffeehouse, where you can warm up with coffee, tea and hot chocolate and enjoy various genres of live music weekly! If you’re looking to try something new I recommend taking classes at Food Lab or POSHsplat. Both of these places offer cozy interiors and fun, unique activities that will get you out of the house and add some cheer to those cold winter days and nights. Food Lab is a recreational cooking school and demonstration kitchen, the teachers are all local or professional chefs who will help you learn to master a variety of different types of cuisines. POSHsplat is a wine and paint studio that offers step-by-step painting instructional classes! Along with endless great activities to do in the wintertime downtown there are several events that celebrate the upcoming holiday season! Switch on the Holidays is happening on November 18th kicking off the holiday season. Santa will be counting down the grand illumination of the Boulder County Courthouse and Pearl Street Mall. Starting Friday, November 23rd and Saturdays from November 24th-December 22nd St. Nick on the Bricks will be happening! Kids of all ages can visit Santa at the Downtown Visitor Information Center for free! And you don’t want to miss out on the Lights of December Parade which is back for its 30th anniversary happening on December 1st. Enjoy floats created and decorated by local businesses, churches, schools and civic groups! I can’t wait to check out the newest holiday event, Freezie Fest on December 8th. Stay tuned for more details on that one!